In a runoff contest widely viewed as a referendum on allegations of voter suppression and disenfranchisement that marred Georgia's midterm races this year, Republican former state Rep. Brad Raffensperger has won the election for state secretary of state, the Associated Press projects. Raffensperger defeated former U.S. Rep. John Barrow in the race, which advanced to a second round after no candidate received a majority of the votes last month. Normally something of an afterthought at the national level, the secretary of state election gained prominence in the aftermath of Georgia's high-profile gubernatorial contest. It was a prime example of the Democratic voter enthusiasm in 2018, but one in which Democrat Stacey Abrams nevertheless fell short of upsetting her Republican rival, Gov.-elect Brian Kemp. Republican candidate for Georgia Secretary of State Brad Raffensperger participates in a debate in Atlanta, Oct. 2, 2018. On Election Day last month, Raffensperger received 49.09 percent to Barrow's 48.67 percent, a difference of just over 16,000 votes. Voting that night, and early voting in the weeks prior, overseen by the secretary of state's office, featured scores of complaints across Georgia about voter registration purging and difficulties in obtaining absentee ballots and confirming their receipt and legitimacy. Kemp, who defeated Abrams with 50.22 percent of the vote, narrowly avoiding a runoff himself, served as secretary of state until Nov. 8, two days after Election Day, leading to accusations of a conflict of interest by Abrams and others who believe his office's efforts affected his own race. 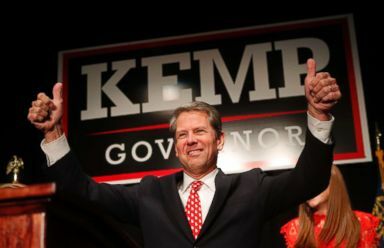 Kemp stepped aside from the position before Abrams conceded the race, as her campaign fought for a runoff by arguing for the inclusion of some additional provisional and absentee ballots. In her eventual concession on Nov. 16, Abrams was critical of Kemp and the secretary of state's office. Democrat Georgia Secretary of State candidate John Barrow speaks during a campaign stop at Daniel Field in Augusta, Ga., Nov. 5, 2018. "To watch an elected official who claims to represent the people in the state baldly pin his hopes for election on suppression of the people's democratic right to vote has been truly appalling," said Abrams, the former Georgia House minority leader. 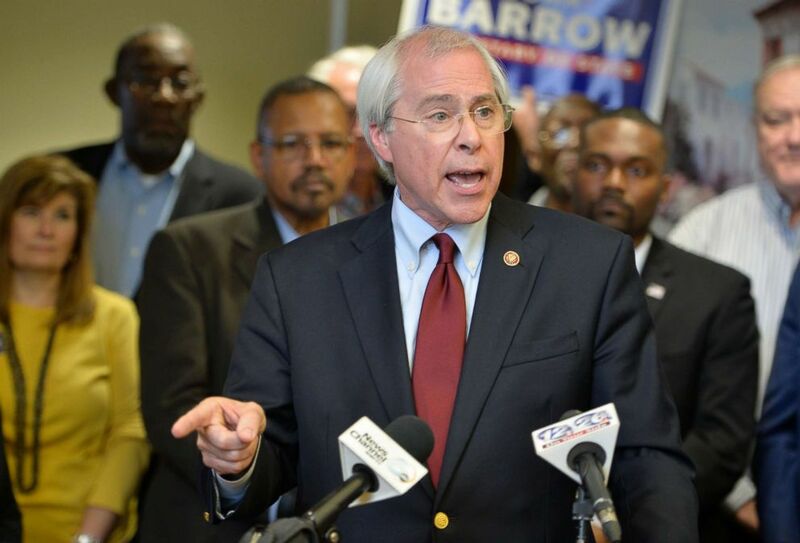 Barrow, who represented Georgia's 12th Congressional District from 2005 to 2015, was banking on the resiliency of Democrats' enthusiasm in the aftermath of Abrams' defeat. It's believed Abrams' presence at the top of the ticket helped a number of Democratic candidates across the state, including Rep.-elect Lucy McBath, who upset Republican Rep. Karen Handel in the 6th Congressional District north of Atlanta. 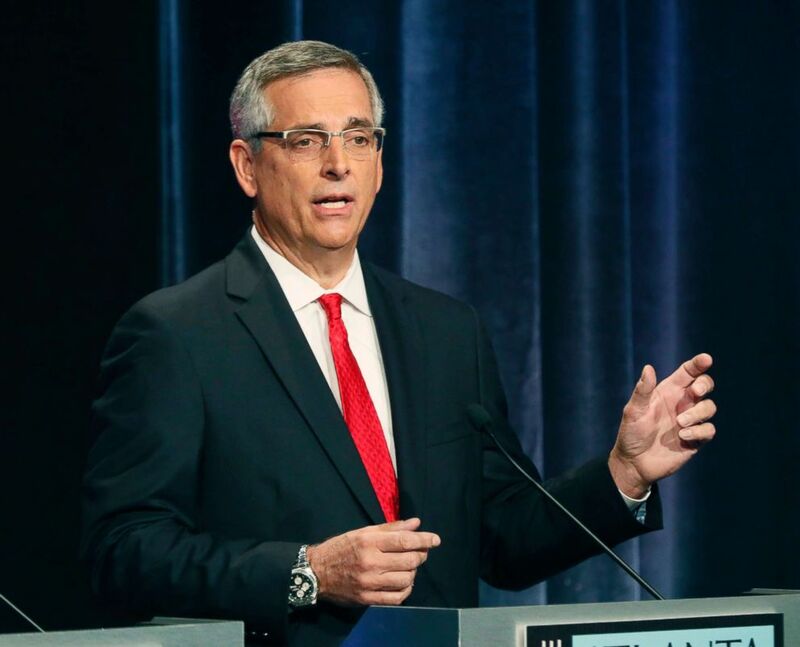 Raffensperger's candidacy was not only endorsed by Kemp, but by President Donald Trump, who weighed in on the race via Twitter last week. ....starts today, election is on December 4th. @VoteBradRaff is tough on Crime and Borders, Loves our Military and Vets. He will be great for jobs! As described by its website, the Georgia secretary of state "organizes and oversees all election activity, including voter registration, municipal, state, county and federal elections. That person is responsible for certification of election results as well as certifying the qualification of candidates and preparation of ballots and election forms and materials." The office also includes divisions which register corporations and regulate securities and charities, among other responsibilities. Georgia Republican gubernatorial candidate Brian Kemp gives a thumbs-up to supporters, in Athens, Ga., Nov. 7, 2018. But it was the contentious gubernatorial election that brought the office to the national spotlight. Last week, a group affiliated with Abrams brought a federal lawsuit against the interim secretary of state, Robyn Crittenden, seeking reforms that included halting voter purging practices, requiring the use of voting machines that provide paper confirmations and taking steps to reduce lines at polling places. 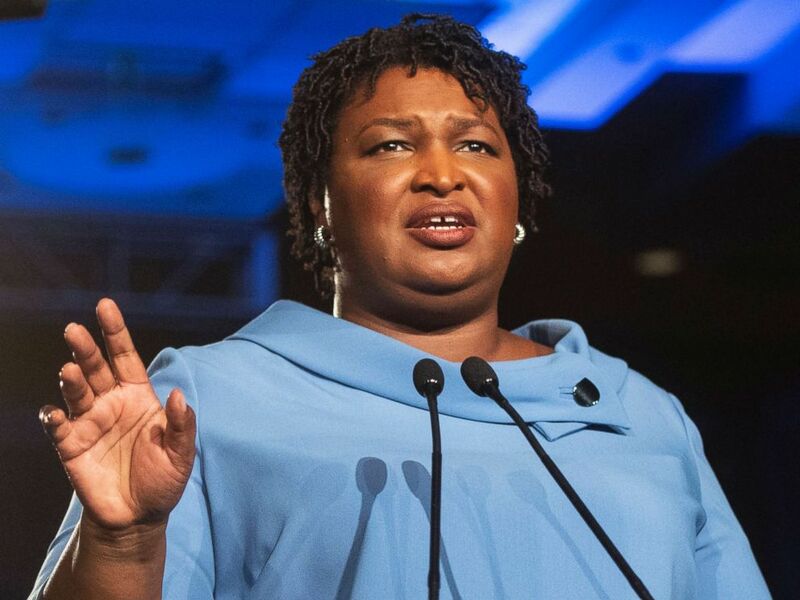 "While we've been able to use the court systems in recent days to force some of these changes, we need a leader who will do these voluntarily," Abrams said, referring to Barrow, on a call with reporters over the weekend. Additionally, the suit seeks the re-implementation of federal government oversight of any future changes the state wishes to make related to elections -- a step known as "preclearance" that was rolled back in 2013 after a challenge was successful with the U.S. Supreme Court. Raffensperger, the newly elected secretary of state, could potentially make a number of these changes before the case is decided, but the Republican is less likely to be amenable to the demands as Barrow would have been. Abrams said Saturday that no matter the winner, the lawsuit will proceed.